The United Nations Support Mission in Haiti (UNSMIH) was established by the Security Council on 28 June 1996. 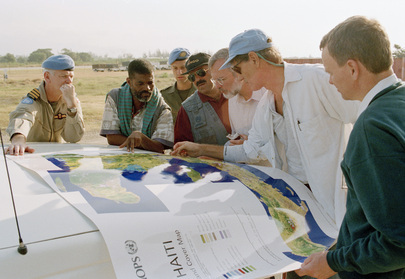 Enrique Ter Horst (third from right), Special Representative of the Secretary-General for Haiti, looking at a map of Haiti with members of the Canadian Battalion of UNSMIH. The group was planning a trip to the northern part of Haiti with a United Nations Development Programme specialist (second from right) to assess damage to the forest in Haiti's National Park.